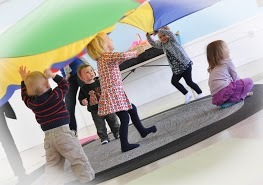 All our classes are for children ages birth-5 years and the adults who love them! 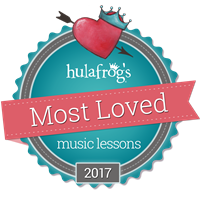 Treetops Music is thrilled to be voted Hulafrog's 2017 and 2019 Most Loved Music Lessons! Thanks everybody! Did you know that all children are musical and most can obtain basic music competence - the ability to sing in key and keep a beat? Our mixed-age Music Together® classes will help your child achieve that, but that's not all. While playing with music, neural pathways develop that otherwise wouldn't; social skills flourish; language and large and small motor development progress -- and best of all, the bond you're developing with your little one becomes deeper through music and movement. Music is the world's language but it's also a very personal one. 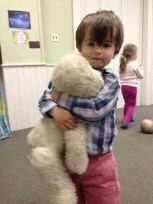 Our classes are for children 0-5 years and the adults who love them! SPRING - The new edition of the Tambourine family songbook series is debuting this spring! Each song is brought to life through colorful and engaging illustrations by award-winning artist Jaime Kim and children's book illustrator Gerald Kelley. The new book will inspire your family to play with music all week long. You'll find it helpful to learn the lyrics, as a jumping-off point for creative storytelling, and to learn more about the songs you're singing in class. Your child may enjoy snuggling with you and singing through the whole book at once—or opening to a page to tell you what song they want to sing! You'll learn 25 Music Together songs and activities you can recreate at home. We've added a few new songs to go along with our new songbook: "Little Birch Tree", "Inanay", and "Little Blue Car" as well as plenty of old favorites. Your children will experience the contrast between galloping, slowing, sleeping, then jumping up with delight to gallop again in "See the Pony Galloping". They'll love pretending they're little bunnies with "Hippity, Happity, Hoppity" and enjoy acting out "One Little Owl". The beautiful lullaby, "Raisins and Almonds" will soothe them with the story of a little goat trotting to market while the baby sleeps. Are you ready for spring? In addition to your weekly classes, your tuition includes materials for you to use at home and a family newsletter full of resources and music-making ideas, and online access to the curriculum through the Hello Everybody app. Our classes are 45 minutes long and typically run for 10 weeks*. Please join us for a spring full of song and giggles! *This spring we're offering a 4 week Music Together Family Favorites Interim Semester. See our Registration page FMI. *You must read our Terms and Conditions/Policies before registering. Thank you. Our family classes are playful and full of fun! Research shows that some children prefer to sit and observe while others learn best while in motion. Our program supports all learning styles. We look forward to making Music Together with you soon!